The total solar eclipse began at 08:30 GMT on March 20, 2015, in North West Europe and moved towards the northeast but still in northern Europe. It was most visible from the North Atlantic and Arctic Oceans, Greenland, Iceland, Ireland, the United Kingdom, Faroe Islands, northern Norway, and Murmansk Oblast. The shadow began its pass off the south coast of Greenland. It then moved to the northeast, passing between Iceland and the United Kingdom before moving over the Faroe Islands and the northernmost islands of Norway. The shadow of the eclipse was visible in varying degrees all over Europe. 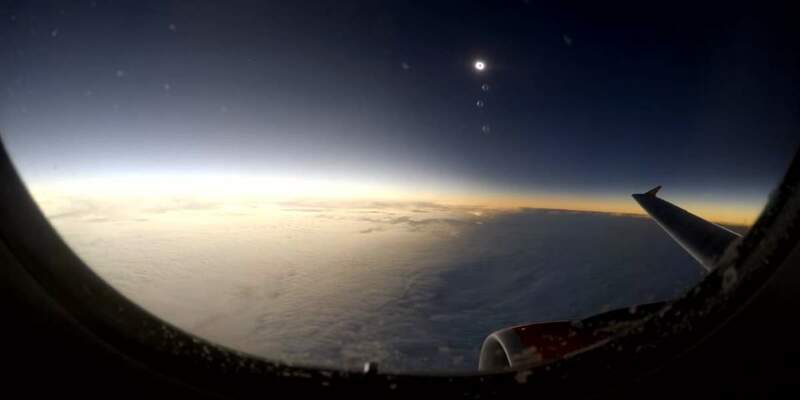 For example, London experienced an 85% partial solar eclipse while points north of the Faroe Islands in the Norwegian Sea saw a complete solar eclipse. Three chartered airliners flew above the clouds, giving passengers a slightly prolonged view. Astrophotographer Martin Junius captured this amazing image during the solar eclipse on March 20, 2015.